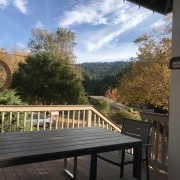 Summary: I went to a meditation retreat for animal advocates! It was really easy to relax, and it reminded me of the wisdom that I have learned about living in peace and harmony with myself and others. Going to the retreat helped me re-commit to my new project of healing and wellness for animal advocates. Read my story to learn about some of my first experiences with meditation. 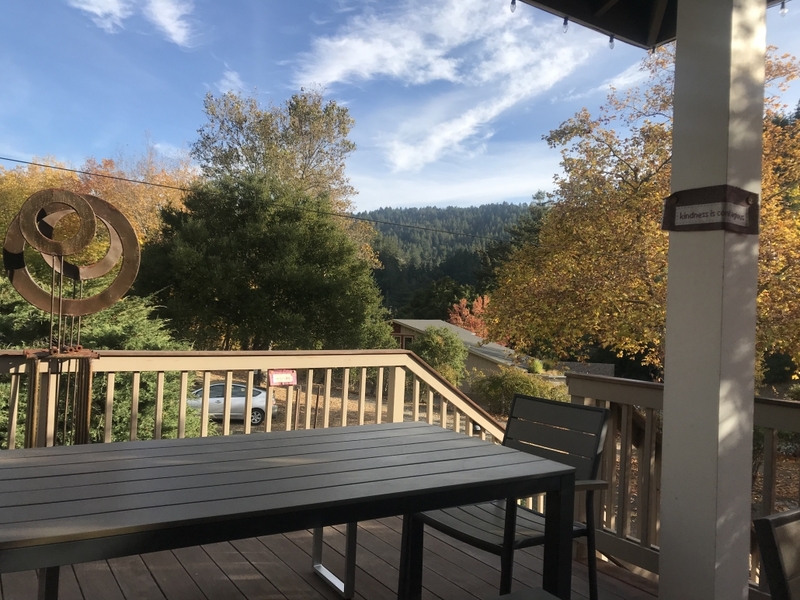 I attended the 2018 Thanksgiving Meditation Retreat for Farm Animal Advocates last month in the San Francisco Bay Area of California. The retreat was planned by long time animal protection activists and meditators. The same folks had hosted meditations at the Animal Rights National Conferences in 2017 and 2018. I had attended those meditation sessions and found them to be healing and helpful, so I wanted to attend my first-ever meditation retreat. The retreat was a week long, and each day included meditation, yoga or some physical activity, lecture and discussion, meals and chores, and breaks. The schedule was simple and regular. The instructor is a Buddhist monk. The meditations were guided, and were an hour or less. Meditations included kindness meditations, walking meditations, and more. I usually took naps during breaks, and often walked up the road from the meditation center. I had a very easy time settling in, which I did not expect. I felt just a little bit of restlessness about two days in, but it was not severe and quickly passed. I suspected I would feel confined and would want to talk to people more, read news, talk to friends and family back home, or otherwise reconnect more with the broader world. That didn’t happen. For a little while, I felt bored. That was a surprise! I have very rarely felt bored as an adult. I mentioned this in a group discussion, and the instructor said that boredom is a useful feeling because it gives us the opportunity to let our feelings and experience sink in and give us space to experience them. I think it helped me remember what is important. The biggest challenge I faced was what I observed as religious intolerance from the instructor. I thought a few of the things he said were demeaning to Christians and Hindus. I talked to both the facilitators as well as the instructors about my concerns, and I was satisfied that they listened and assured me that they shared my values. I felt that my concerns were addressed. Giving myself time to unplug is healthy. Taking things slower gives more opportunity to be aware of myself, my surroundings, and others so that I can respond with wisdom and without hastily judgment. There were many teachings about wisdom that I found illuminating. For example, there are three poisons: attachment, aversion, and indifference. Attachment is looking at things and thinking, ‘what is in it for me?’. The antidote is love, or ‘what is in it for all of us’. For aversion, the antidote is compassion. For indifference, the antidote is rejoicing in the virtue of the other, and recognize that all sentient beings have something to contribute. It’s hard to get across much of the wisdom in this relatively short text. I recommend checking out the Boundless Love Project for wisdom teachings. I am humbled to have the privilege to do this. I recognize that not everybody has the time and funds (the retreat relies on voluntary donations, but it costs money to travel to attend the retreat) to attend. I recommit to challenging class privilege and also to making meditation and healing accessible to low income people. I am planning a healing retreat for animal advocates in June of 2019. I am planning this with two other people, Freeman from the Boundless Love Project and Nina, who planned a retreat in May of 2018. This retreat will have similar goals, activities, and audience. I am continuing to host meditations for animal advocates in Minneapolis. The next one is on January 9 Meditations are one half hour long followed by a meal. The meditation is open to anybody who cares about animals, and the intention is to deepen our practice and our compassion for all life. The meditations are open to all people of any or no religious or spiritual practice or belief. I am starting to promote these a little more, including having an email list and Facebook group. You are welcome to join. I have not yet led meditations, but I am considering leading meditations in the future. I want to deepen this practice. Since the retreat, I have been meditating just a little more regularly and have given myself more unplugged time. I had a portable speaker that I would listen to music or podcasts while biking, and I have stopped this. I take a few more breaks away from talking on the phone and listening to podcasts each day. My parents immigrated from India before I was born, and I was raised in the United States and was raised Hindu (1). Only many years later would I come to recognize the practices I participated in as meditation. At the Hindu Mandir (then in Minneapolis), starting around age 5, I did some yoga. Later I continued this at the School for Indian Languages and Culture, which is a secular institution. I remember saying to my dad that shavasana is the easiest pose. He countered that it was the hardest, to have the mind be still (I now understand meditation as something different, see below for details). Especially in India, which I went to every few years, we would often pray to Shiva, Krishna, and miscellaneous gods at the temple or shrine at our house or go to the nearby temple. I also had my Upanayam, which is a religious initiation ceremony, and practiced Sandhyavandhanam (daily prayers). What all of these had in common were ritualistic chanting and motions that were simple to do and facilitated the relaxation of the mind. Later, as a teenager, I became an enthusiastic long distance runner. For a few years I ran most days, sometimes alone. Running regularly made it so I could raise my heart rate to a certain level that was enough of a challenge that it was a good workout, but not so difficult that I had to concentrate all my attention to keep up the pace. The mechanics of running are so rote that it takes no thinking to run. I later noticed that running helped me find calm. These practices benefited me greatly at the time, though I didn’t label them as meditation or understand some of the benefits I now appreciate. Later into adulthood, I have participated and learned about a few different kinds of meditation practices and communities, including this retreat. (1) Hinduism is an incredibly diverse religion and the practices and beliefs vary enough that I have little idea what other people’s experiences are, or what the religion as a whole is, outside of what I was raised in!